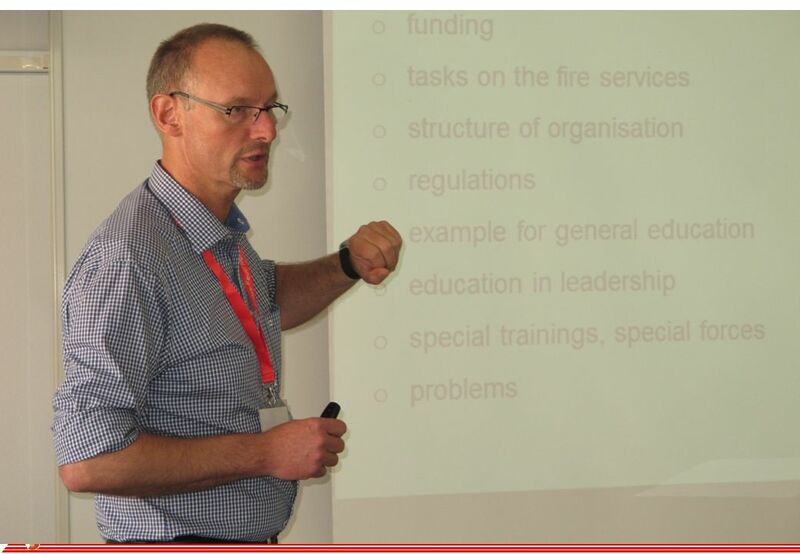 6 What for – Who – What – How….? 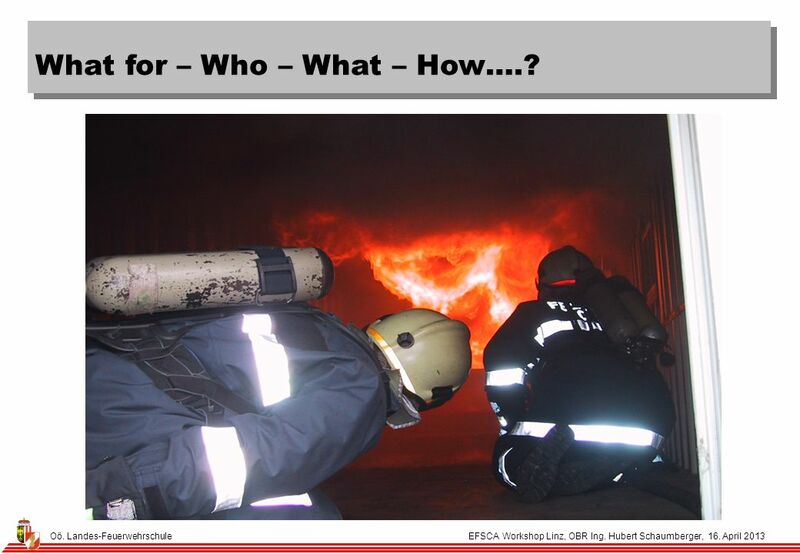 What for – Who – What – How….? 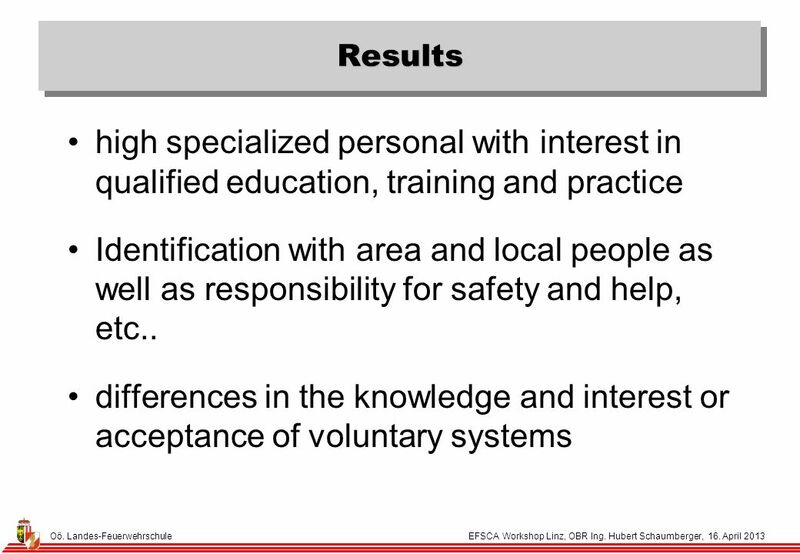 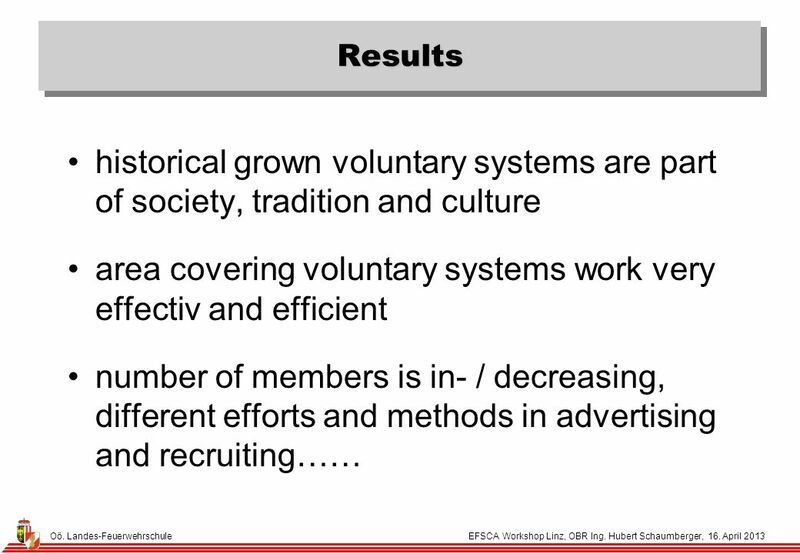 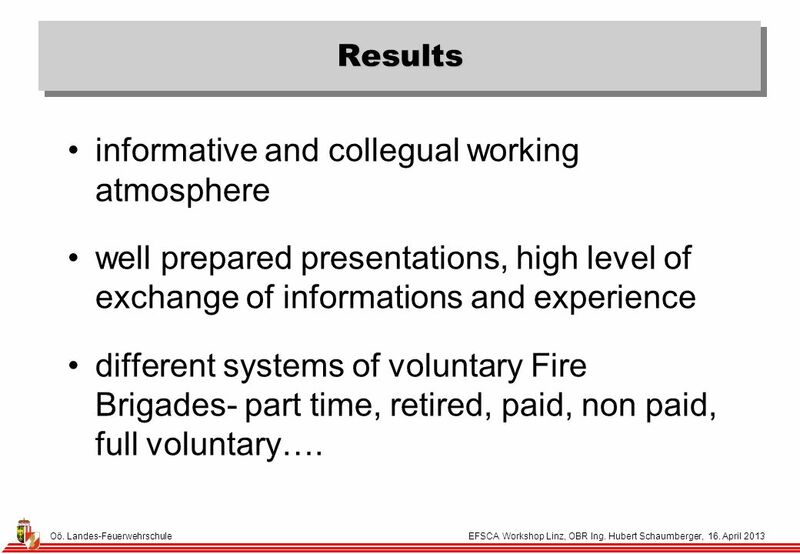 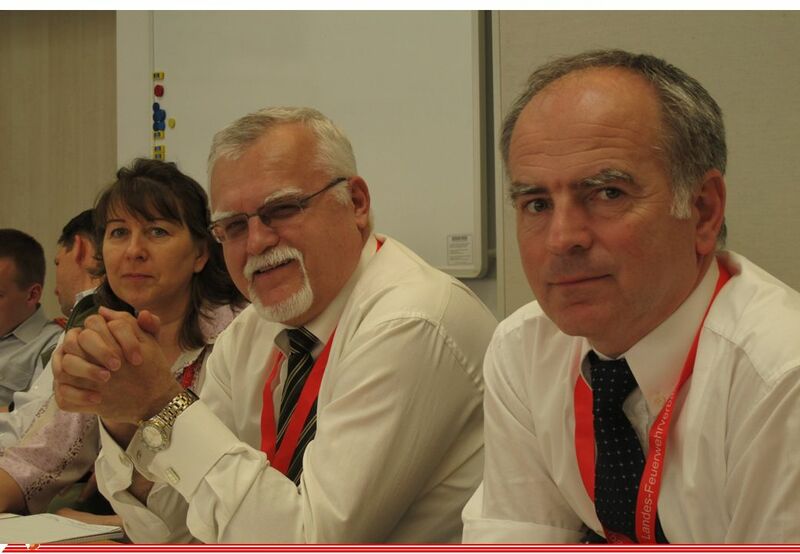 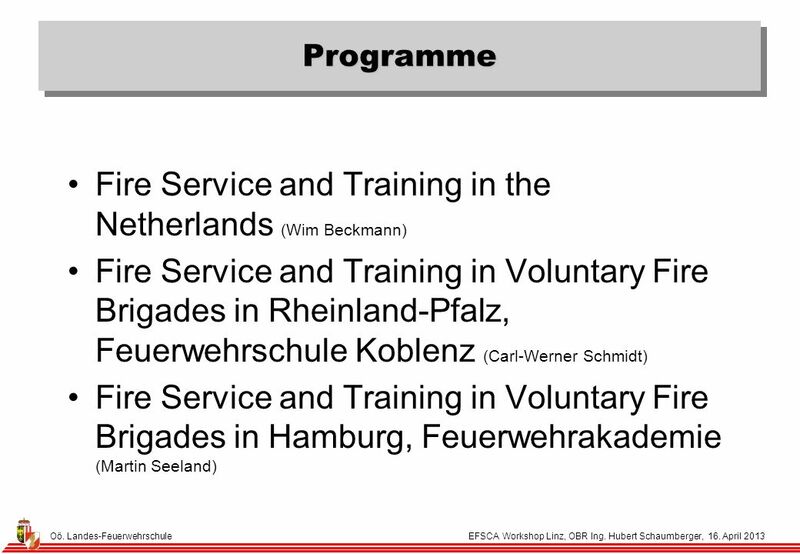 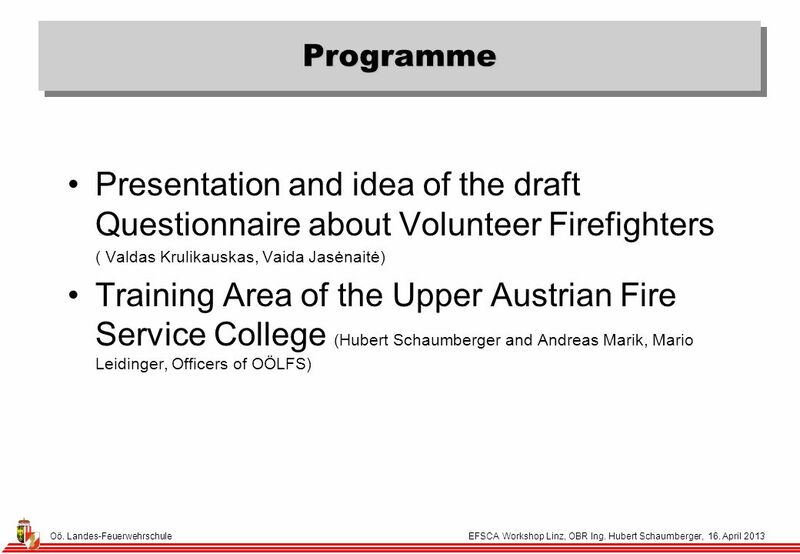 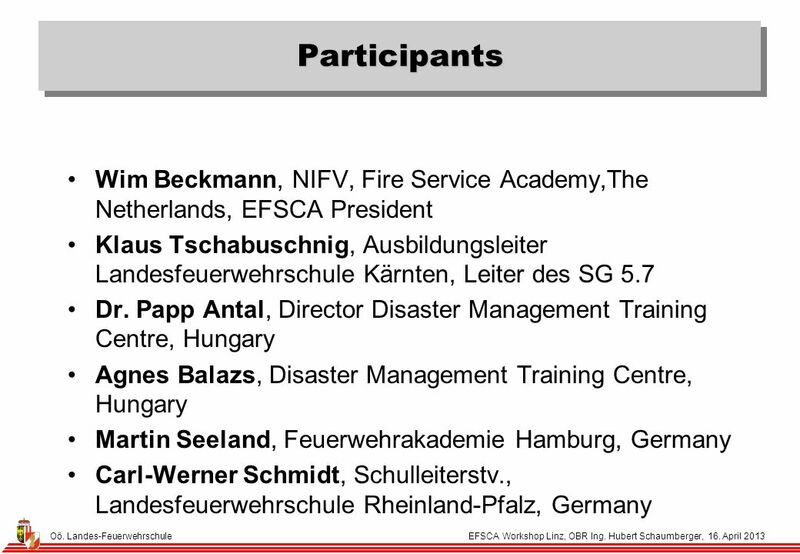 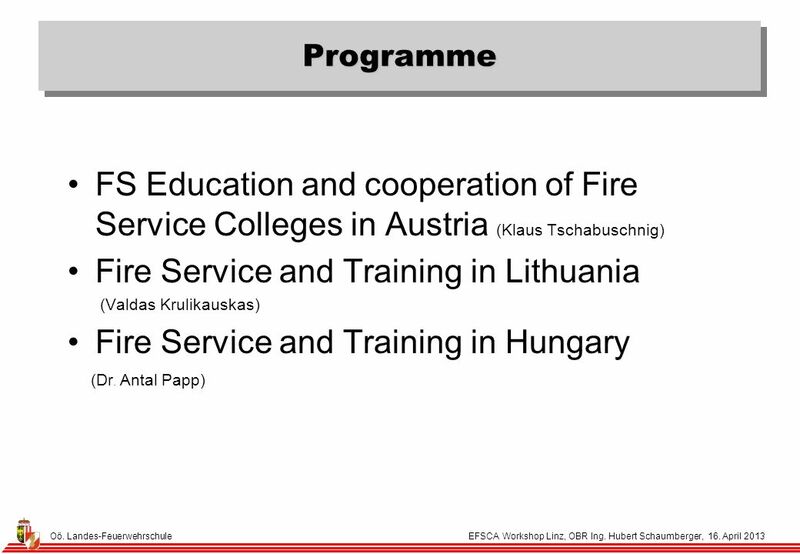 26 Results informative and collegual working atmosphere well prepared presentations, high level of exchange of informations and experience different systems of voluntary Fire Brigades- part time, retired, paid, non paid, full voluntary…. 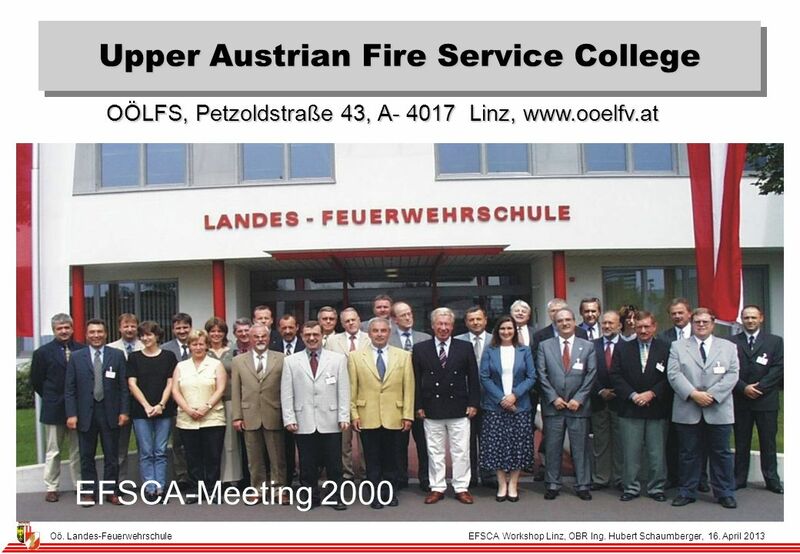 30 Oö. 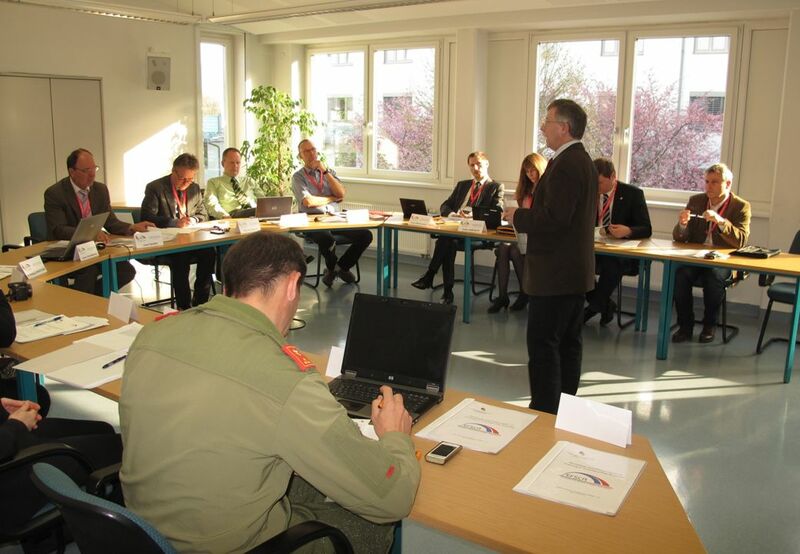 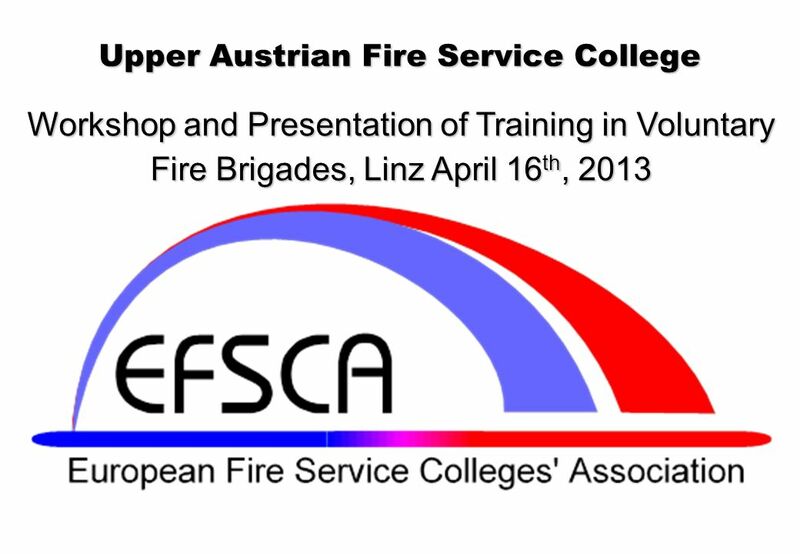 Landes-Feuerwehrschule EFSCA Workshop Linz, OBR Ing. 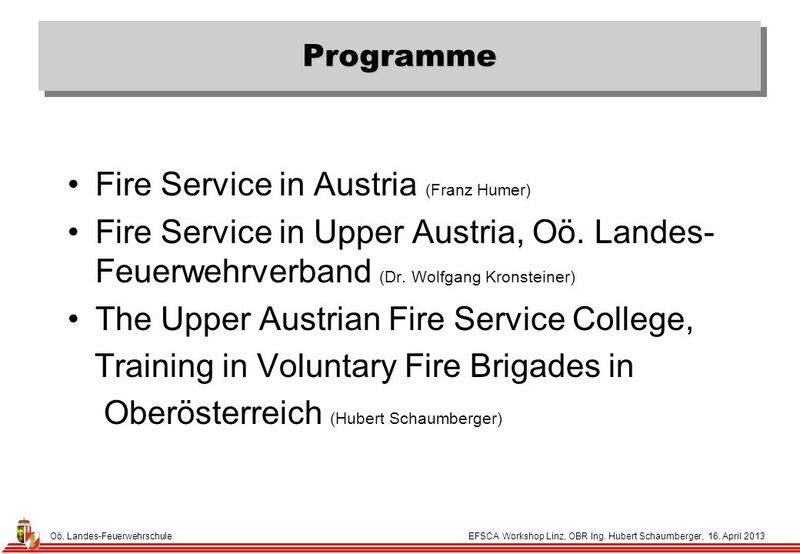 Hubert Schaumberger, 16. 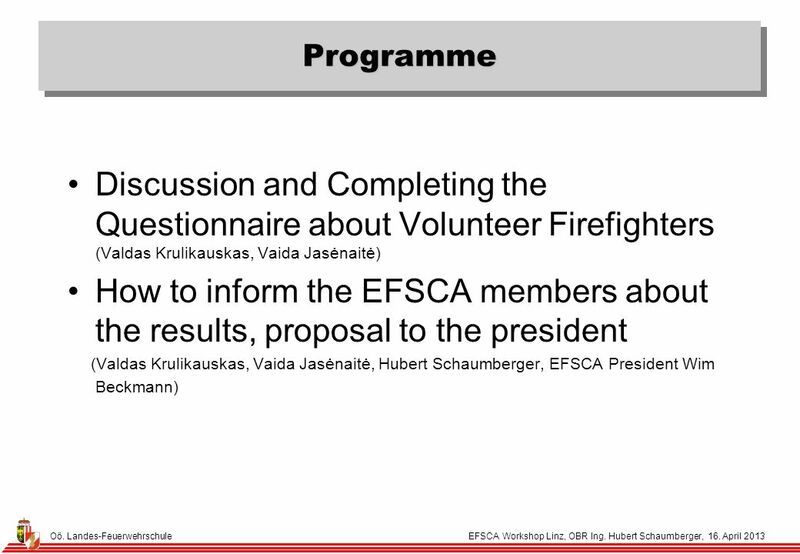 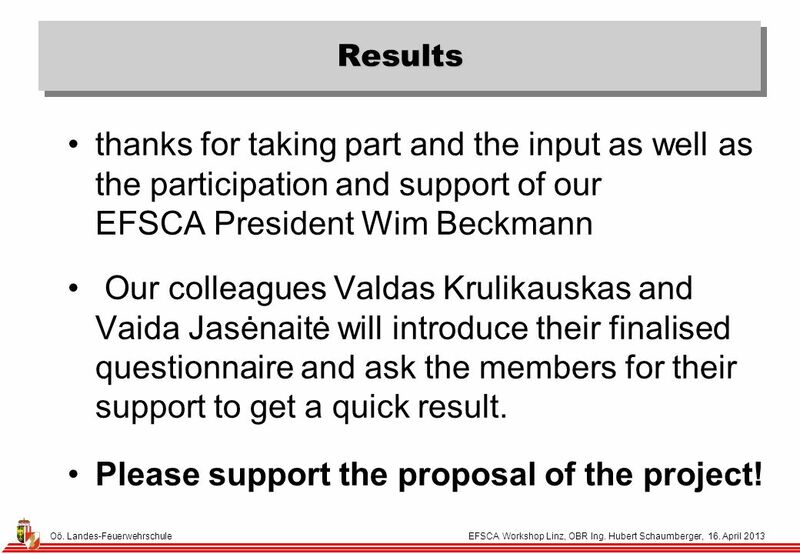 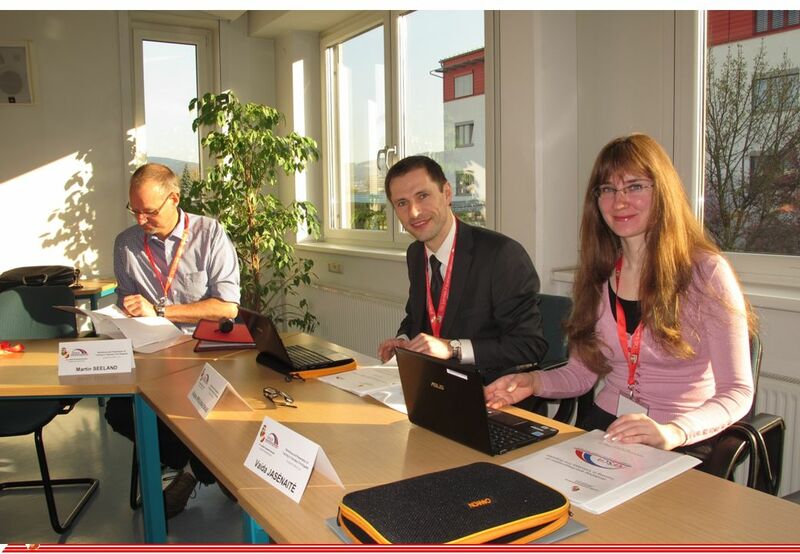 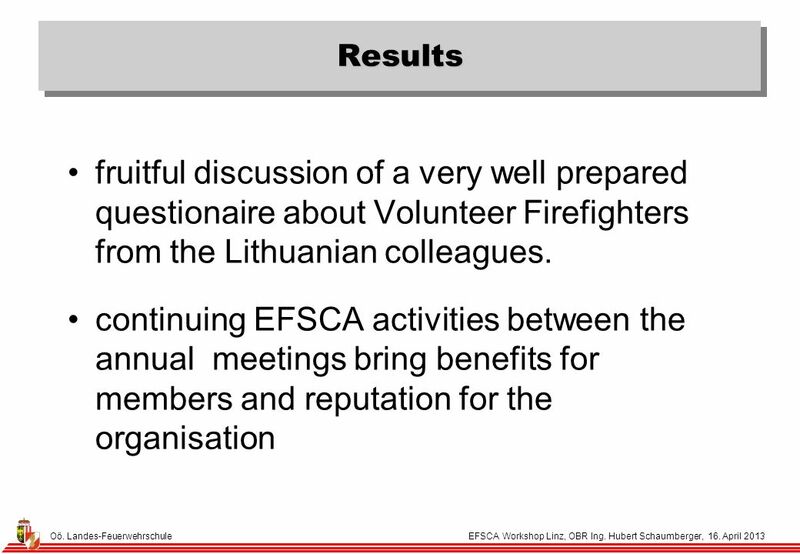 April 2013 Results thanks for taking part and the input as well as the participation and support of our EFSCA President Wim Beckmann Our colleagues Valdas Krulikauskas and Vaida Jasėnaitė will introduce their finalised questionnaire and ask the members for their support to get a quick result. 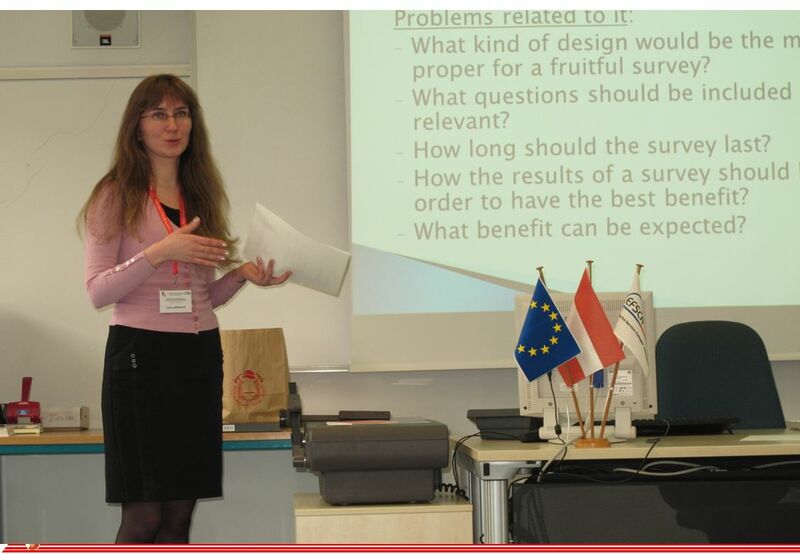 Please support the proposal of the project! 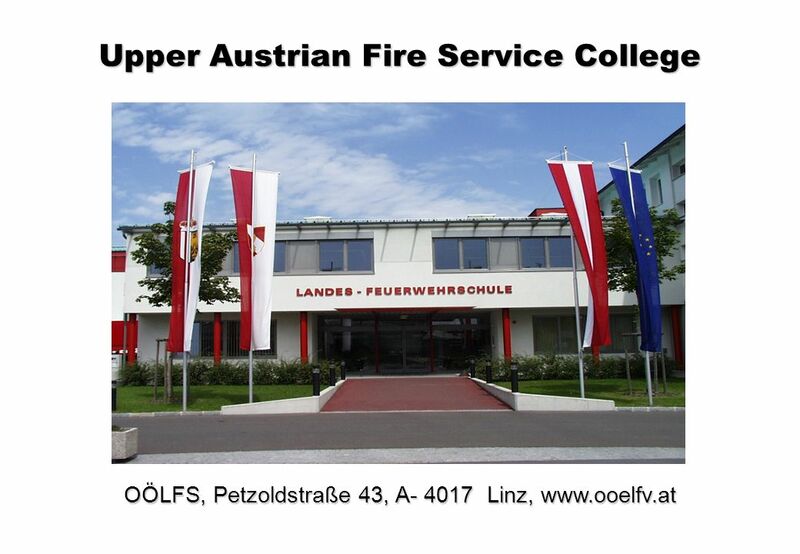 31 Oö. 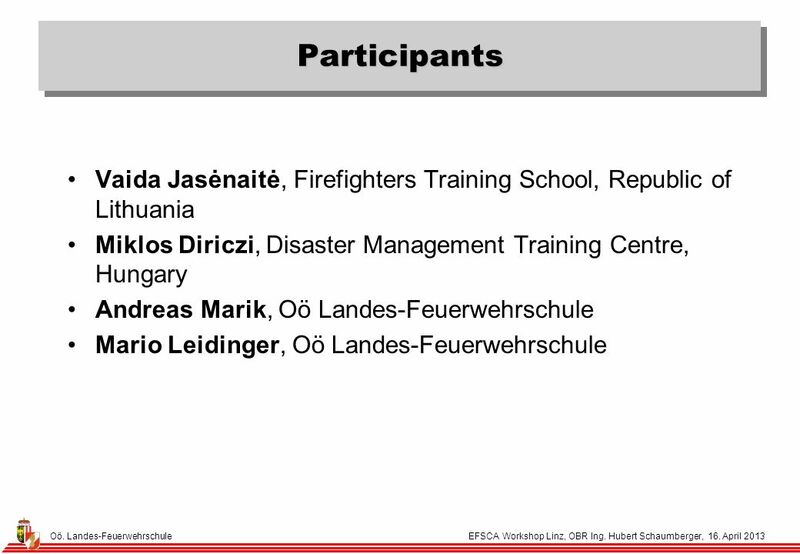 Landes-Feuerwehrschule EFSCA Workshop Linz, OBR Ing. 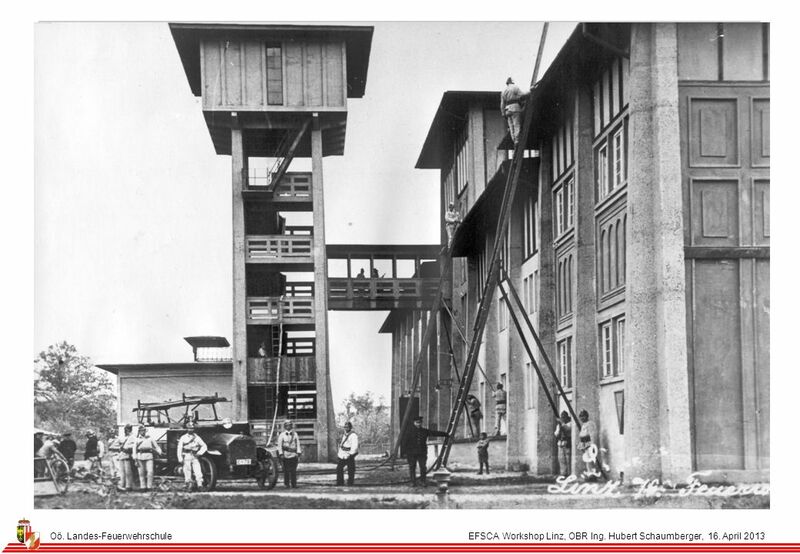 Hubert Schaumberger, 16. 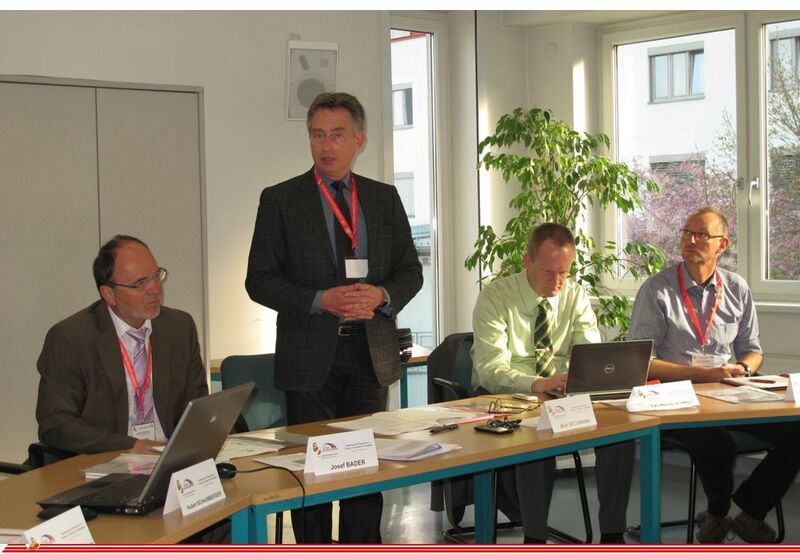 April 2013 Hubert Schaumberger Oö. 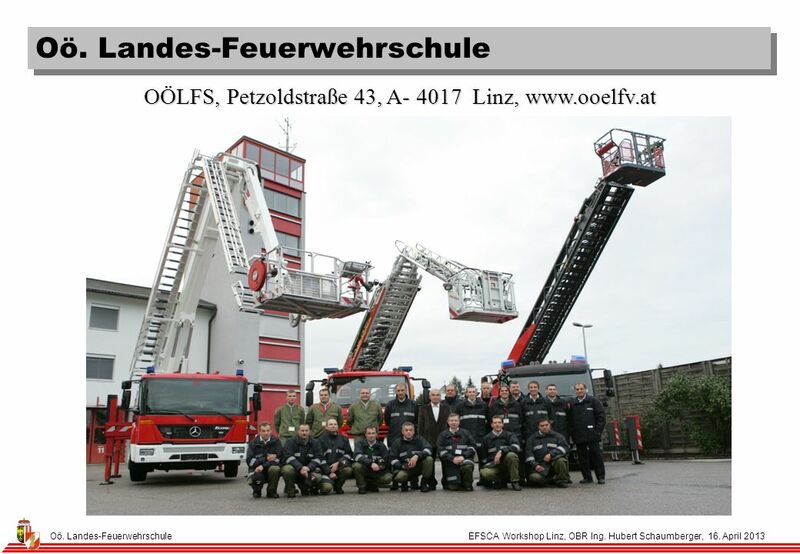 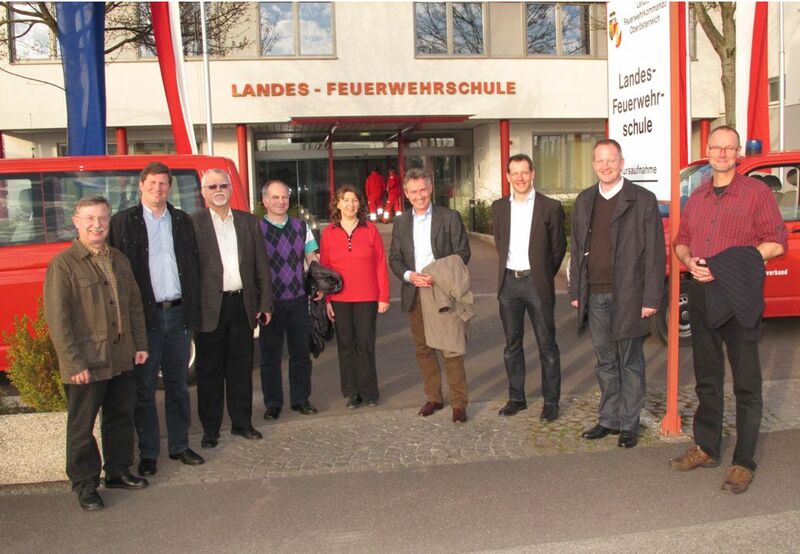 Landes-Feuerwehrschule, Linz Thank you for your attention! 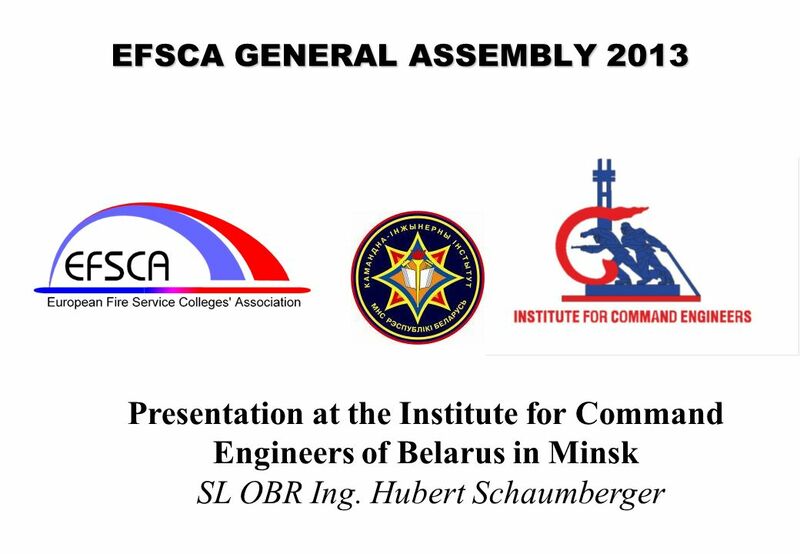 Herunterladen ppt "EFSCA GENERAL ASSEMBLY 2013 Presentation at the Institute for Command Engineers of Belarus in Minsk SL OBR Ing. 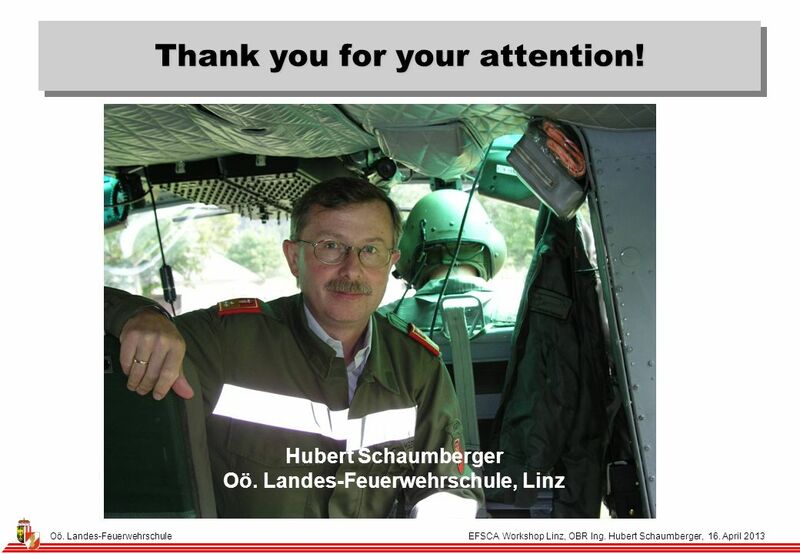 Hubert Schaumberger." 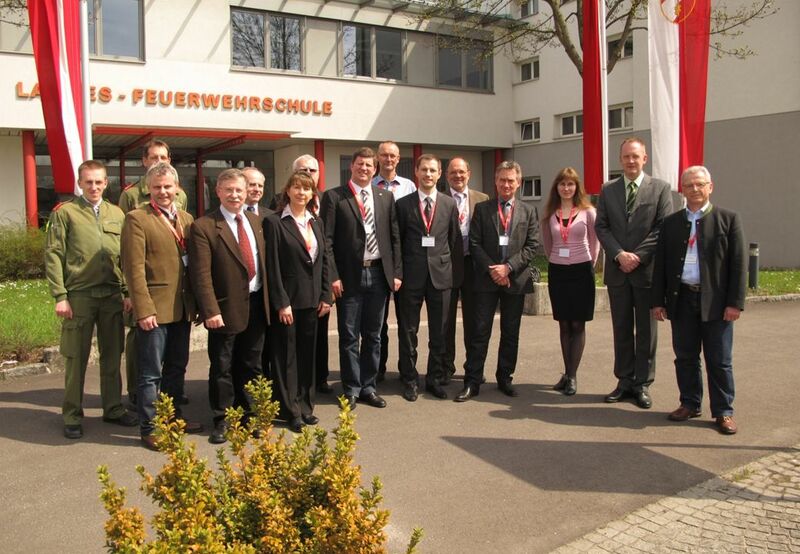 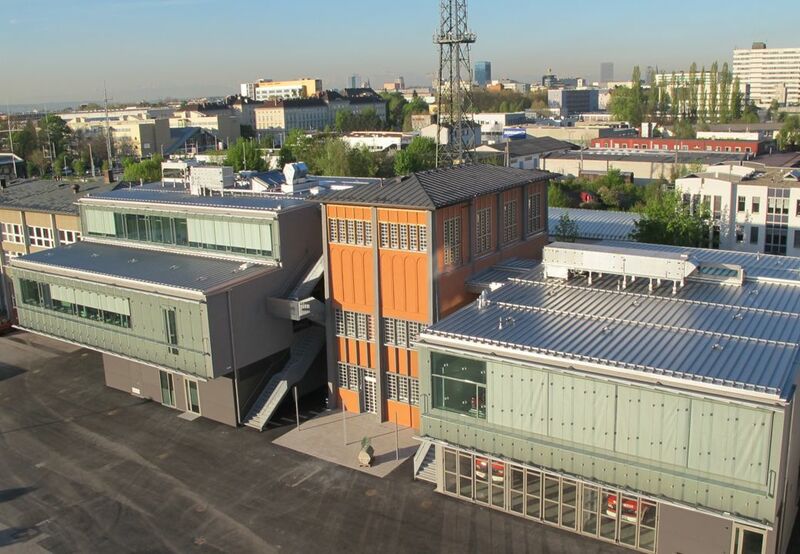 Institut für Umweltschutz in der Berufsbildung e.V. 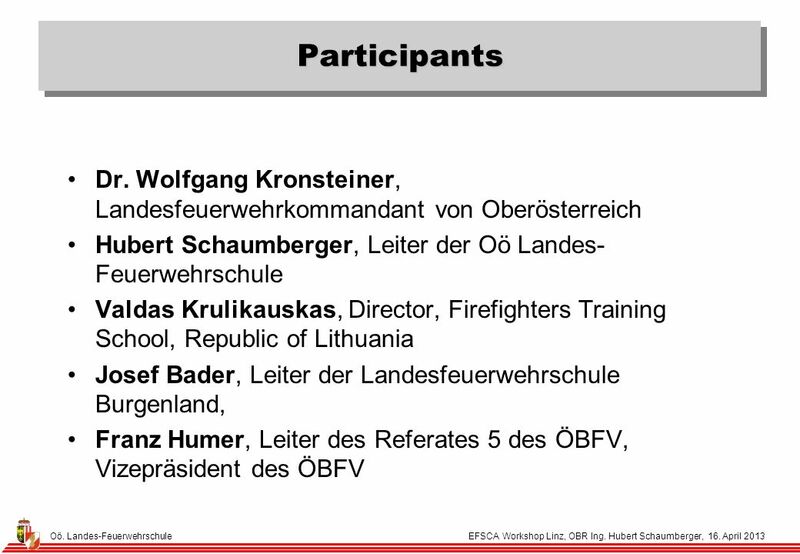 Folie 1 ALBATROS Ziele Jahreskonferenz 2004 Ziele der Albatros-Jahreskonferenz 2004 Objectives of the. 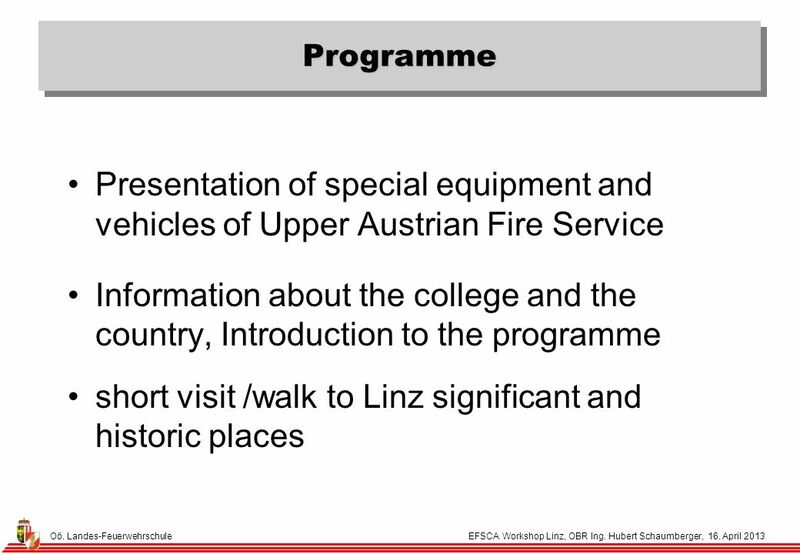 Foundation/ Higher Tier Role Play 2 At the tourist information office.